With four months to go before the opening of the Las Vegas Arena, a phalanx of IT pros is finding creative solutions to enhance visitor experiences at the new venue. 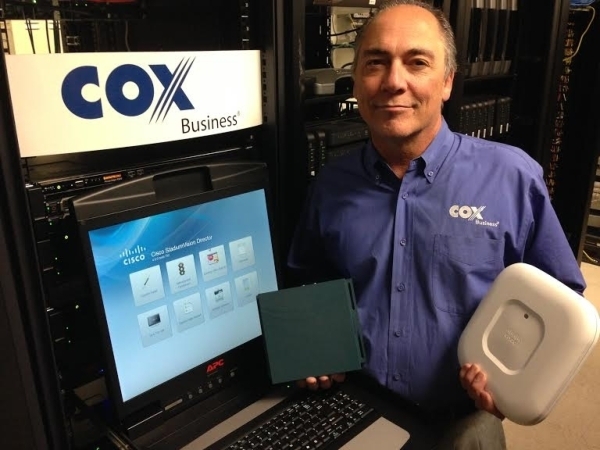 While Cox Communications’ Cox Business/Hospitality Network has been named the technology integration and telecommunication services provider for the arena, it will take a village to get the job done right. “The broadband infrastructure we provide will directly enhance the guest experience for both attendees who visit the Las Vegas Arena and the employees who work there every day,” says Pat Cesser, president of Cox Communications. It is an infrastructure that will combine the efforts and resources of several industry leaders in technology. The Cox division that will be operating the arena is the Hospitality Network, a unit that has spent more than three decades providing advanced technological services to hotel rooms, convention, trade show and meeting room space across the United States. The Cox Business/Hospitality Network designed and constructed a 10-Gigabit diverse and redundant fiber optic network for the Las Vegas Arena to support the deployment of wired and wireless Internet connectivity inside the venue. Utilizing Cisco Connected Stadium Wi-Fi, more than 550 Wi-Fi access points inside the Arena will deliver targeted download speeds of up to 20 megabytes per second to Wi-Fi enabled devices. When the arena opens in April, guests will be able to authenticate their free Wi-Fi connectivity as they approach the arena from Toshiba Plaza, an adjacent two-acre outdoor entertainment space. Although Cox has vast experience developing Wi-Fi networks in hotels, convention centers and other large venues, the task of developing the network at Las Vegas Arena was unlike any other. The combination of the Las Vegas Arena’s bowl shape and the constant movement of people in and out of the bowl causes Wi-Fi devices to continuously “beacon” or search for a connection. This activity places an enormous strain on a network and creates a large amount of IP-based interference inside the arena’s bowl configuration, which causes even greater challenges. To accompany the infrastructure, Cisco’s StadiumVision will provide an immersive differentiated video experience for fans throughout the venue. There will be content placement on the Arena’s 650 high-definition and 4,000 digital displays, several video walls, the Daktronics scoreboard above the arena floor and the facility’s massive Jumbotron at the entrance. The 650 individual digital displays can be partitioned into many visual arrangements, creating high-visibility marketing platforms for advertisers, sponsors, concessionaires and merchandising partners. “All of this digital real estate will display video content whether it is real-time, in-house feed, advertising messages or programming from any of the 60 channels of content we are providing the arena from the Cox channel lineup,” says Fountain. To monitor the user experience and maintain a high quality of service, the WiFi network will be supervised by several tools, including Cisco Advanced Services to assist in designing the proper locations and orientation of antennas.